Mika Taylor has always had it bad for Trent Hunter, but she never had the guts to talk to him. Now that her best friend moved away, Mika dreads having to face a school year at Vernon Secondary alone. And being classed as the school freak doesn't help matters. When Trent finally looks at her and not through her, Mika starts to think grade eleven won’t be so bad, after all. Getting to know Trent better, she can't shake the feeling there is something he isn’t telling her. 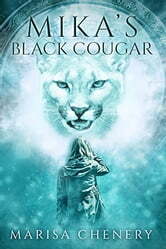 A chance encounter with the fabled Okanagan black cougar has her putting two and two together. Mika sees not only the black cougar along with another cougar lurking in her backyard, and she has to wonder if things can get any stranger than they already are.